I’ve never written a follow-up post before. I’ve kind of stayed away from them, to be honest. I mean, everyone knows sequels are never as good as the originals. Unless, of course, you are talking about the Rocky movies, in which case it is indisputable that Rocky II is the best movie ever made. But sometimes rules are made to be broken, even if those rules only exist in my head and no one knows about them and they make very little sense anyway. So this week I have broken my no-sequel-unless-it’s-a-Rocky-movie rule so I could follow-up on our conversation from last week. Quick re-cap: in my last post I talked about how my 10-year old son Jack feels very, very alone with his autism diagnosis. I compared him to a magical unicorn in that he is unusual and solitary, beautiful and mystifying. I asked readers to post about people in their own lives who are diagnosed with this tricky disorder. I read each and every message, e-mail, comment, and post. I read them and I re-read them and when I was done with that, I read them all again. I cried every time. Joe does not handle the crying well. He does not know what to do when I cry. He kind of clears his throat and looks down at his feet, bewildered. Eventually he offers me a cookie.This usually works, and I stop. But I could not stop because you kept writing. You wrote stories about your favorite people and how much they love Minecraft and Legos and spaceships and pirates. I saw Jack in your words. I saw myself in your words. I breathed in your hope and encouragement, pain and love. And the comments from the dads? Well, they simply dissolved me. I think it’s because I know how much it would take for Joe to share about his son on a blog or in a Facebook message, to reveal the pain and hope and fear that is unique to a father’s heart. Friends from high school reconnected. Old colleagues reached out, and one mother shared about her quiet child’s beautiful smile. Teachers from around the country spoke. Minnesota, New Jersey, Oregon, Illinois, San Diego, California. A few of you courageously shared a piece of yourselves. Throughout the week Jack asked for my phone so he could read the comments you each left. Watching his face light from within, I could tell you did what I could not. Through words and sentences and paragraphs and social media, you connected my son to a larger world beyond himself. You showed him that yes, there are other magical unicorns. Many of your posts about your tender little toddlers reminded me of the days when Joe and I were in the trenches of autism. See, right now we live with autism, we struggle and sometimes rejoice with autism, but that’s nothing compared to the heat of the diagnosis battle, when you’re trying to figure out services and early intervention and speech therapy, all while your little guy or gal is tearing up the house and starting the car. I wrote here about how the biggest fight I ever had with Joe was over Oreos. And this is true, it was. But perhaps the most damaging fight I’ve ever had with my husband was years later, when Jack was two and a half. I walked in the door one afternoon in January and announced he was starting in an integrated preschool in downtown Buffalo the following week, and he would take the bus. “I’m just saying. Don’t you think this is all a little fast?” Cue enormous argument and four-day standoff. If I’ve learned anything from the posts this week, it’s that autism casts a wide, arbitrary net. Sometimes the net scoops up more than one from a family, other times it is a solitary selection. After dinner one night this week, I sat down to my laptop for a few minutes to read all of your comments again and start putting my notes together for this post. Predictably, Jack came in to hover over my shoulder and beg for Itunes. But once again he was drawn into the thread on Facebook, to the pictures and details and descriptions of your daughters and sons, students and grandchildren, nephews and neighbors. And then he paused for a moment. Jack bounded out of the room to take his shower, and I sat in our little office thinking back to our fight about integrated preschool. Goodness, how I hated my husband that cold, gray day in Buffalo. I hated him for standing in my way and not understanding my panic. But now–eight years later–I realize that everyone’s heart breaks differently. Joe needed more time to understand and absorb the neurological anomaly in his tiny son’s brain. Yet I was racing against an imaginary spectrum clock, racing to find services and early intervention and the best occupational therapy. In the end we were both right and both wrong and both heartbroken. I guess all this time I thought bajillion was a number, a fictitious way to quantify replies to a random blog post. You have shown me I was wrong. It’s not a number at all. Bajillion is confusion and fear and golden dogs named Scooby. It is boys from Michigan and girls from Utah and a 13-year old with perfect pitch. It is rage and disappointment, grace and unity. It is facing each other across the dinner table night after night with the same pit in your stomach while your son screams and thrashes on the floor because the squash is too yellow too yellow too yellow. It is Disney movies and breathtaking memory and the extraordinary gift of unusual people. It is brothers sliding down autism’s slippery bell curve together, laughing and giggling and looking up to the bright blue sky overhead. It is a no rules Yo Adrian kind of thing. If you want, you can click here to see the entire thread of Facebook comments from the week. Warning: reading them may cause crying. And laughing. And head-nodding. Who knows? You may even see a unicorn. I started to tear up when I realized that Joe had posted about it. What a wonderful thing you have done for Jack in reaching out to all the other people in the world who have autism too. 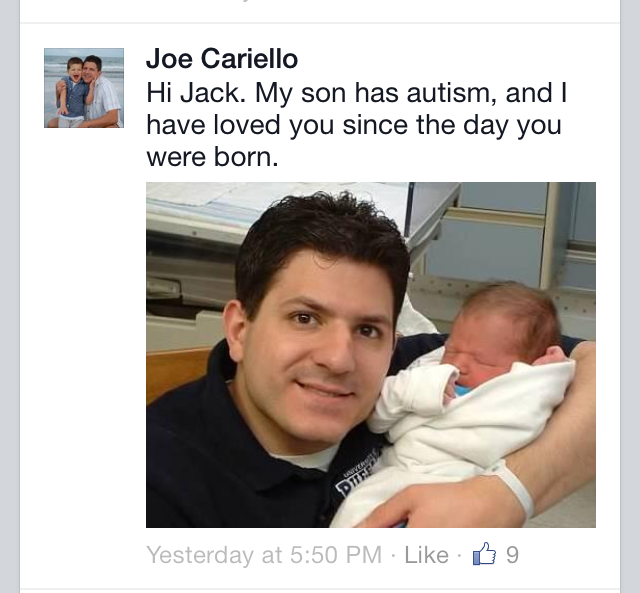 I just wish that every kid with autism had the support that you and Joe have given Jack.